unknown Number of Native Americans hired. 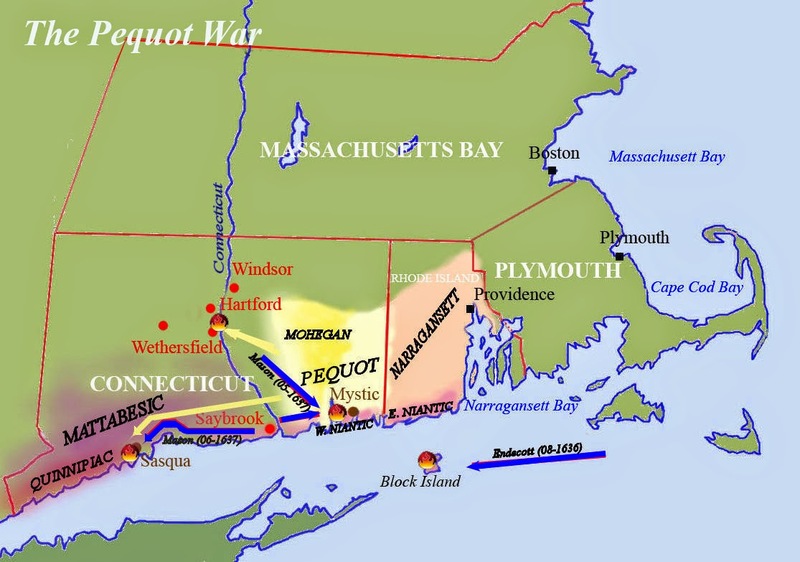 The Pequot War was a war between the American Pequots and English settlers and their allies in the Massachusetts hinterland beginning in the fall of 1636 . It followed an attempt to colonize Amerindian lands, itself driven by many deaths due to epidemics among Pequots. An escalation of violence and xenophobia led to its iconic event, the Fort Mystic Massacre , a crime that sealed the fate of the natives. If the Hartford Treaty of September 21, 1638 Officially ended the war, it was in fact a one-way street for a year already and even took the form of a severe oppression of the last Pequots. In 1633 , the Pequot tribe saw its numbers drop from 8,000 to 4,000 as a result of a smallpox epidemic, a disease brought by the settlers, which created tensions with them. 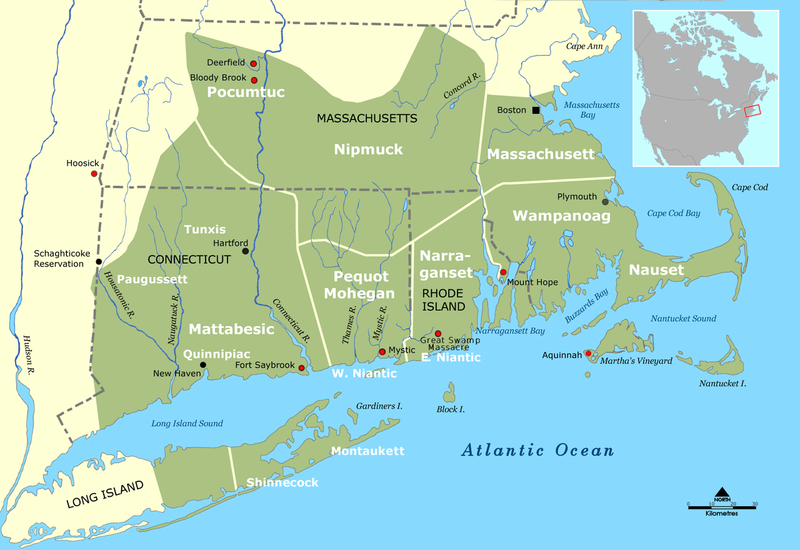 In 1634 , as a result of a rivalry with the Narragansetts tribe, about the trade with the Dutch, Tatobem the Great Sachem Pequot was killed and replaced by his son Sassacus. The July 20, 1636 John Oldham, an English merchant, is killed by Narragansetts off Block Island . John Winthrop , then governor of the Massachusetts Bay Colony , asks John Endecott to conduct a punitive expedition to Block Island, then to join the colonization- coveted region of the Connecticut River to exhort the Pequots , accused of murdering British soldiers, to deliver the guilty and pay compensation. The August 25 , Endecott leaves Boston with a small troop and goes to Block Island where he can only destroy houses, because the Narragansetts hid in the swamps. Worried by this failure, he reached Connecticut where the Pequots welcomed him and accepted the discussion. They say they did not know that the killed soldiers were English. Endecott does not believe them and threatens to attack them if they do not deliver the murderers' heads. Native Americans refuse and want to negotiate. Endecott launches an attack that leaves several dead and a few dozen wounded. This is the beginning of the war. The Pequots besiege Fort Saybrook during the fall of 1636 and the winter of 1637. During the siege, the belligerents enter into talks but, probably as a result of a misunderstanding, the Pequots address to the military a message interpreted by Major Lion Gardiner as the threat of killing Connecticut men, women and white children. Several clashes ensue. Thirty settlers perish, the victims on the Amerindian side are difficult to count. The failed talks, the fears and the exacerbated hatreds have an even more terrible consequence. On May 1, 1637, Connecticut settlers set up 90 men under Captain John Mason for an offensive against the Pequots. Later, a pastor at Hartford Church exhorts these soldiers to a slaughter. Joined by a large number of Pequot enemy Amerindians, including Chief Uncas' Mohegans and Chief Miantonomoh's Narragansetts, they advance toward the fortified village of Missituck (Mystic), home to pequot warriors and their families. They are finally joined by the men of Captain John Underhill, Massachusetts. As for the Spanish conquista, the Pequot war was a European military victory thanks to the massive Amerindian military addition.